Is Invisalign in Columbia Right For Me? If you had braces as a teen but find your teeth have snuck back into their original position, or if you never got the chance to undergo orthodontic treatment at all, it’s not too late to improve your smile. And with clear braces, you can do so without everyone else knowing about it, too. Invisalign in Columbia uses a series of clear plastic aligners to shift teeth into their preferred position — to help you flash a smile you’re proud of. Let’s take a look at how Invisalign works, what are the benefits of Invisalign, and is Invisalign right for you. FDA-approved and used by over 3 million smiles worldwide, Invisalign is a series of plastic aligners designed with you and your bite in mind. Worn for about two weeks each, the trays place focused pressure on a different part of your bite, gradually moving teeth to where they should be. You’ll check back in with your doctor at regular six week checkups to make sure everything is progressing as it should. Treatment time may range from eight to 18 months, depending on the severity of your misalignment. Removability: With Invisalign, you can simply slip out your tray before meals and when it’s time to brush and floss. That means you don’t have to make any modifications to your diet, and your teeth stay clean and healthy throughout your treatment. 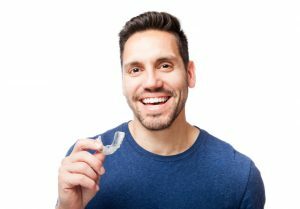 Comfort: You’ll never have to worry about a loose wire or popped-off bracket with the smooth, plastic Invisalign trays. Convenience: With a shorter average treatment time, fewer required visits to the dentist, and less need for emergency appointments (like a loose wire or bracket), the Invisalign system offers far more convenience for busy adults. Good question. If you’re an adult interested in improving the alignment of your bite, chances are excellent that Invisalign is a great option for you. The system can be used to correct the most common orthodontic issue, including gapped and crowded teeth as well as underbite, overbite, and crossbite. Patients should undergo a general checkup and cleaning before beginning with Invisalign. Instances of tooth decay or gum disease should be treated in advance of any type of cosmetic dentistry in Columbia. Ready? Let’s Get Started Today! If you’re interested in improving your smile with clear braces for adults, why not give Invisalign a try? Contact our office to schedule your appointment with Dr. Batson, your dentist in Columbia, today. You can also request your visit online. Comments Off on Is Invisalign in Columbia Right For Me?